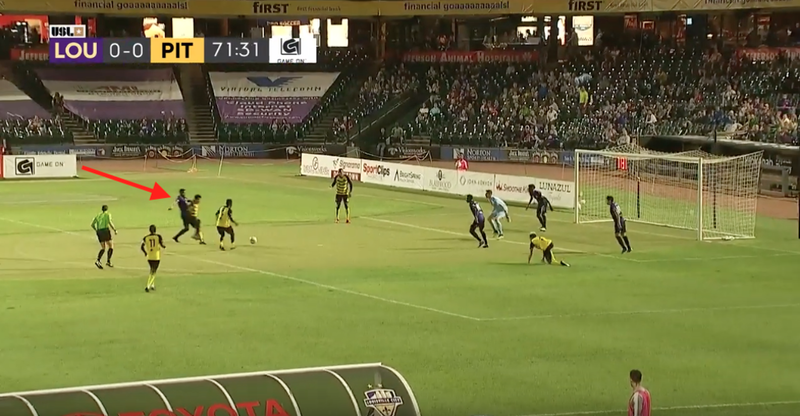 It only took one for Pittsburgh Riverhounds SC (1-1-2) to notch its first win of 2019, as the club defeated two-time reigning champion Louisville City FC (2-3-0), 1-0, on Saturday at Slugger Field. Coming by way of the penalty spot, Neco Brett posted his first tally of 2019. Here is how the Hounds earned their penalty kick, and goal, this past weekend. Brett’s resting-ball boot all started with a fast break. 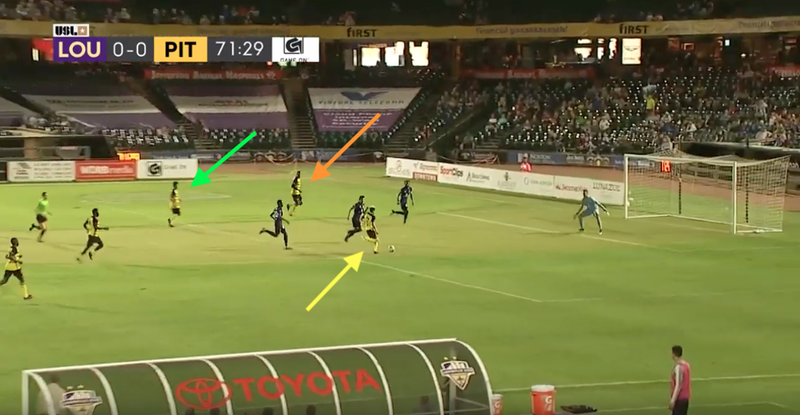 Sprinting down the field and leading a 3-on-2 advantage, Anthony Velarde (green arrow) dribbles straight at a Louisville defender to freeze him in his tracks. 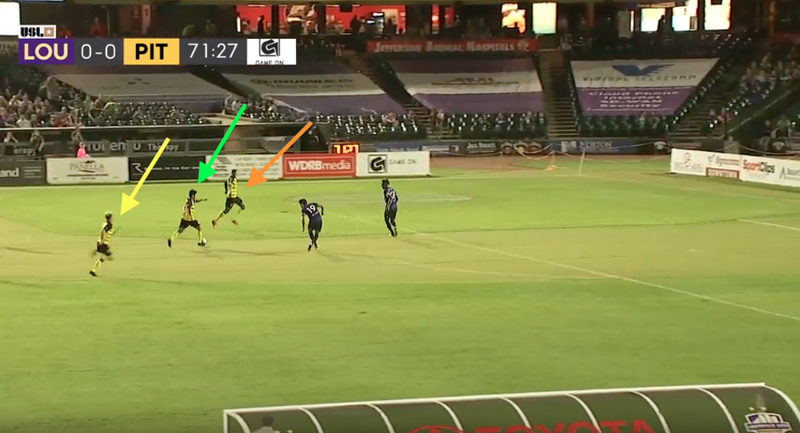 As the second defender moves toward Steevan Dos Santos (orange arrow), it allows outside back Ryan James (yellow arrow) – who makes an excellently timed run to join the attack – to break free to Velarde’s right side. James’ shot at the net would be saved by goalkeeper Ben Lundt, but a rebound would stem from the scoring chance. With Louisville’s backline scrambling, Velarde and Brett converge on the loose ball in the center of the penalty area before defender Alexis Souahy (red arrow) commits a costly foul. To complete the train of events, Brett blasts a powerful penalty kick by Lundt to provide Pittsburgh with a 1-0 advantage and win. Just as pivotal as the Hounds’ success in the offensive third was the club’s play in its defensive third. Over the course of the match, the Black and Gold limited Louisville to only six total shots and one take on target, compared to 11 total shots and three shots on target for Pittsburgh. Further showcasing this disparity were the team’s touches inside of the 18-yard box. Pittsburgh touched the ball 18 times inside of the penalty area whereas Louisville had only six such touches. The Hounds used these advantages to come away with three points on the road this past weekend.